In the ancient times much before Kaliyuga, the sages i.e rishis headed by Sage Kashyapa intended to perform a great sacrifice i.e maha yagnam for the welfare of the society. As it was a maha yagnam, the sages wanted to invite one of the Holy Trinity to be the Chief Guest of the occasion. Bhrigu Maharishi takes up the responsibility of inviting the Chief Guest as he has special access to all the lokas (i.e worlds). It is believed that Sage Bhrigu is born with an eye on the under surface of his right foot. According to the other version of the story, Sage Narada during his course of journey descends on the Earth and knows about the maha yagnam to be performed by the rishis. He then asks, "O great rishis! whom are you going to please with this sacrifice? Are you going to please the most supreme of the Holy Trinity? Who is the Supreme of the Holy Trinity?" The question left the rishis in confusion. They wanted to know the truth so that they can invite the most Supreme one of the Holy Trinity to preside over the occasion. The great task was assigned to the competent Sage Bhrigu who is unique due to his extra eye. Bhrigu Maharishi goes on space travel and reaches Satyaloka where Lord Brahma (the four headed Hindu god) resides. On reaching Lord Brahma's abode Bhrigu speaks, "O Brahma! this is Sage Bhrigu. I have come to seek the Ultimate Truth". He repeats these words thrice but there is no response from Lord Brahma as He was deeply engrossed in listening to the music played by Goddess Saraswati (His wife) on Her Veena named Madalasa. As his presence was not noticed by Lord Brahma, the infuriated Bhrigu curses Him saying that Brahma will not be worshiped by the humans on the Earth. He then proceeds to Kailasa - the abode of Lord Shiva. On entering into Kailasa, he repeats the same words thrice, "O Maheswara! (another name of Lord Shiva), Sage Bhrigu has come to seek knowledge". Sage Bhrigu then enters Vaikuntham - the abode of Lord Vishnu. Here too Bhrigu encounters a similar situation. Lord Vishnu was in sleeping posture while His wife Lakshmi Devi is seated at his feet pressing His legs - a typical posture of Lord Vishnu and Goddess Lakshmi in Vaikuntham. When he gets no response even after calling thrice, Sage Bhrigu feels insulted and couldn't control his anger. He walks briskly towards Lord Vishnu and hits Him on His chest with his right leg. Lord Vishnu pretends to realize His mistake and feels sorry for the behavior. He then slowly takes the right leg of Sage Bhrigu in His hands and says, "O great Sage! your foot might have got hurt and might be paining. Let me press your foot to soothe the pain." While doing so, Lord Vishnu forcefully presses and ruptures the eye that is on the under the surface of Bhrigu's right foot. With this act of Lord Vishnu, instantly Bhrigu gets devoid of his arrogance. He realizes his mistakes and feels apologetic. Goddess Lakshmi who witnessed / watched the entire sequence gets deeply hurt by the action of Lord Vishnu. She thus says, "Hey Swamy! Your chest is my residing place. Bhrigu has insulted me by kicking on your chest, yet you excused him and pressed his feet. I don't want to stay here any more as I have no respect here." Saying so, Goddess Lakshmi walks away in anger and reaches Kolhapur (a place in Maharashtra). She resided in this place and is worshiped by Her devotees as Kolhapur Mahalakshmi. There spreads dullness all around in Vaikuntham without Goddess Lakshmi. 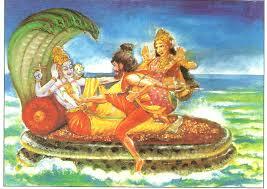 Lord Vishnu too leaves His abode, goes in search of His dear wife and reaches the Earth. After a lot of searching on Earth, the tired Lord Vishnu reaches Tirumala Hills and takes rest in a shady place. Lord Vishnu forgets about His presence and gets into deep meditation reciting the name of Goddess Lakshmi. As the time passes huge anthill develops all around Him. Brahma and Shiva descends on Earth to rescue Vishnu from such a situation. Brahma transforms into a healthy cow while Shiva turns into a calf. These divinely cow and calf cleverly gets into the cattle of a cowherd. Thus, daily the divine cow approaches the anthill and gives milk directly into Lord Vishnu mouth who is in deep meditation. The cowherd who comes to know about this strange act of the cow, throws an axe on it. 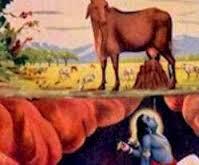 To his surprise, the cow disappears while Lord Vishnu (in the form of Lord Venkateswara) emerges from inside the anthill. The axe hits and hurts the forehead of Lord Vishnu. The terrified cowherd prostrates before Lord Vishnu and seeks apology for his cruel act. The merciful god excuses the cowherd. As it is the cowherd who is the first one to see this form (Lord Venkateswara) of Lord Vishnu, his next generations are blessed with being the first ones to have the darshan of Lord Venkateswara, every day. The practice is still continued. Every day when the gates of Swamivari Garbha Gudi i.e the sanctum sanctorum are opened for 'Suprabhata Seva, the eldest member from the cowherd's family (the cowherd who first saw Lord Venkateswara on Earth) is blessed to be the first person to have the darshan of Lord Venkateswara. After the family member of cowherd's family has the darshan of Swamivaru, the temple priests and other TTD (Tirumala Tirupati Devasthanams) officials enter inside the 'garbha gudi'.